‘Ndlovu’ is a vibrant chorus of African song and dance. 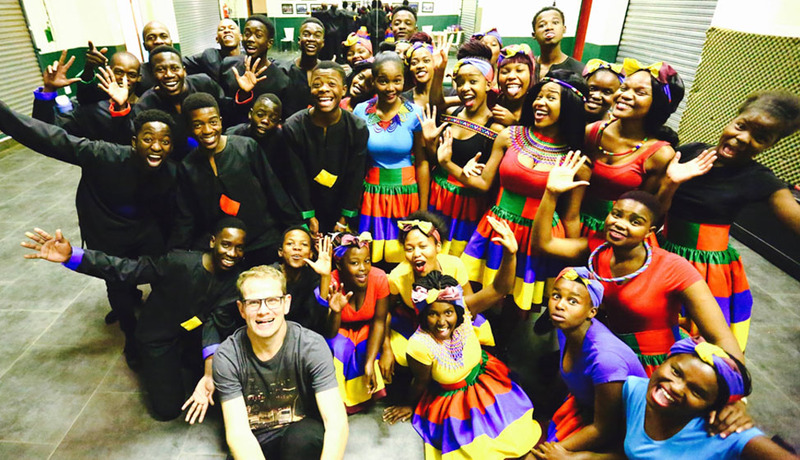 These young singers and dancers are committed to making their audiences smile, clap, sing and feel the warm spirit of Ubuntu in their hearts. The choir promises to deliver an experience of infectious joy. ‘Ndlovu’ performs an impressive assortment of South African music ranging from Afro-Pop/Jazz classics to traditional South African music and arrangements of international hits that creatively incorporate a variety of South African genres. The choir delivers a toe-tapping and energetic South African musical performance irresistibly combined with mesmerising choreography. Performances highlights include collaborations with choirs from Denmark and Canada as well as performances in the UK, Germany and the Netherlands. In September 2018, the choir will be releasing their 3rd album produced by multiple Grammy Award-winning producers Rachel Faro and Jimmy Douglas. As their youthful smiles light up their faces, they will remind you of the very best South Africa has to offer. The Ndlovu Choir was established in January 2009 with the aim of affording talented, underprivileged teenagers and young adults (14-24 years) the opportunity to perform locally and abroad proficiently. The choir consists of 30 choristers from the beautiful Moutse Valley in rural Limpopo, South Africa. The Ndlovu choir is part of the Ndlovu Care Group’s globally acclaimed childcare community programme. The choir aims to ensure that a child from a disadvantaged community enjoys the same level of tuition, care and opportunities as a child from a more affluent society. Choristers that have been part of the music programme at Ndlovu have said that the chance to be part of a world-class extramural developmental programme offers them hope, not only for enhanced opportunities but as a diversion from the challenges that come from living in disadvantaged communities. The risk of alcohol, drugs, teenage pregnancy and other problems are practically eliminated because choral music requires such a time investment. We aim to create a place of comfort and care and strive to nurture values such as self-discipline, self-confidence, tolerance, respect and leadership in our choristers. The choir performs an impressive assortment of South African music ranging from Afro-Pop classics to traditional South African music and original compositions. These young singers and dancers are committed to making their audiences smile, clap, sing and feel the warmth of the Limpopo sun in their hearts. The choir is vibrant, exuberant and colourful, and delivers a toe-tapping and energetic South African musical performance irresistibly combined with mesmerising choreography. You simply cannot fake the contagious joy that the Ndlovu singers pour into their music. As their youthful smiles light up their faces, they will remind you of the very best South Africa has to offer. The Ndlovu Choir are proud ambassadors of rural excellence and we believe that the potential of rural South Africa is an untapped resource bursting with talent. We are proud of our remarkable journey which has seen the choir receive multiple standing ovations across Europe and South Africa. In 2018 the choir will be releasing their 3rd album which was produced by multiple Grammy Award-winning producers Rachel Faro and Jimmy Douglas.